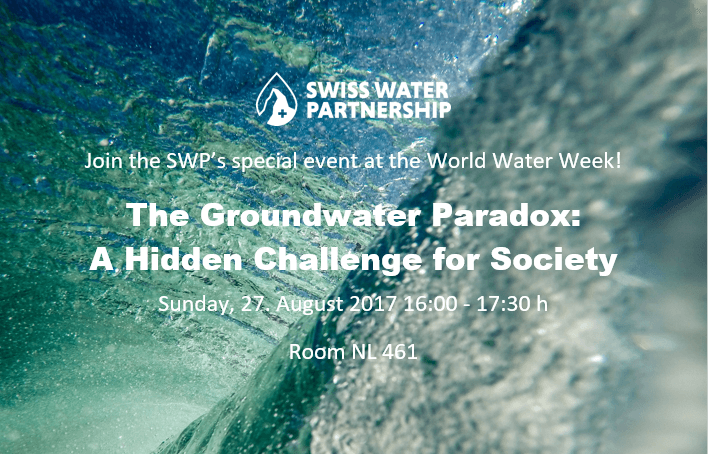 The SWP invites you to join the thematic event on Sunday, 27th August 2017 at the Stockholm World Water Week. Groundwater forms the main source for domestic water in the world: It counts for 30% of total freshwater on earth and 96% of available freshwater. As pressure on water resources continuously increases, it becomes more and more crucial to sustainably manage this resource to guarantee its availability on the long term. Data are necessary to define the aquifer volume that is usable: Dimensions and features of the reservoir, quality, recharge mechanism and seasonal variability. However often these data are lacking or are only partially available. Although humans highly rely on this resource, the majority of involved actors still doesn’t value and invest enough in this “hidden” resource. This event aims at explaining the rationale leading to this paradox and will explore different reasons responsible for the lack of groundwater regulation and governance. Thus the credo: Making the invisible visible. Expect a dynamic, interactive event to reflect and discuss concrete solutions to trigger a change in mind-set with examples from Switzerland, Ghana and Democratic People’s Republic Korea. Note: Registration for the World Water Week 2017 is now open. All the speakers and involved persons need to be registered to attend the week. Early bird registration ends on 30. June. The registration can be found here.